In an age where computers and tablets are constantly borrowing similar designs, gone are the days of innovative concepts. 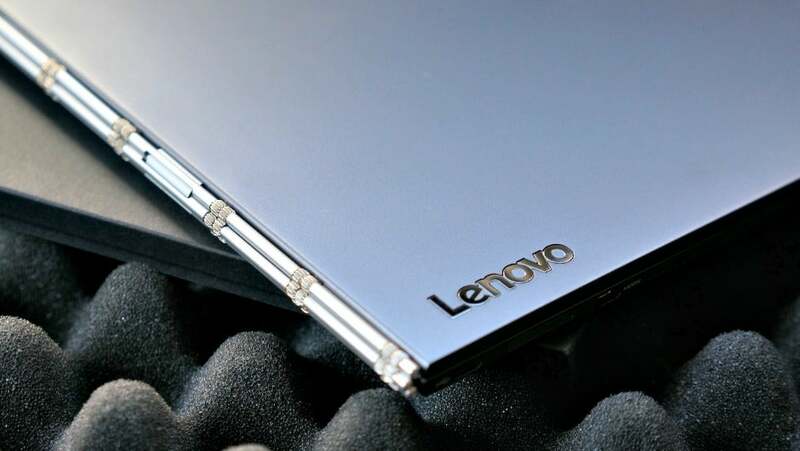 That is except for Lenovo, who has constantly pushed the envelope on their Yoga line, and most recently on their incredibly lightweight Yoga Book series. Not quite a tablet and a bit more unique than your standard ultrabook, the Yoga Book is a beautifully designed system with designers in mind. The closest comparisons you’ll find is the Apple iPad Pro or Microsoft Surface Pro, but at a notably more reasonable price. Over the course of a month, we used the Yoga Book as an alternative to our tablet and smartphone, while traveling, and of course to write this review. So if you see any typos, blame the new Halo Keyboard (mostly kidding). Overall we found the Yoga Book to be a delightful little computer, but fully expect the next iterations to polish some of the rough spots. More tablet than computer, the Yoga Book boasts a lightweight, sleek metallic design with several unique twists. Between Lenovo’s Real Pen and Halo keyboard, combined with a modified Android Marshmallow, the Yoga Book becomes more than a basic web surfing tablet, but a great system to doodle, take notes, and even stream videos. As far as gaming is concerned, your best bet will be in the form of games that you’ll find on the Google Play store, as the processing power can’t quite manage anything beyond that. Overall, it’s still an incredibly versatile device. 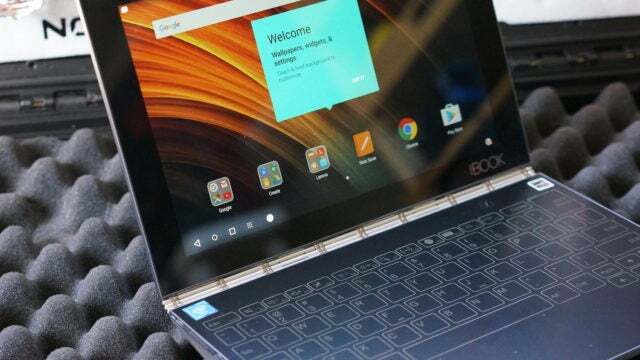 When it comes to performance, the Yoga Book has some shortcomings, but easily knocks out standard word processing, video streaming, web browsing, and mid-quality 3D gaming (apps). Featuring an Intel Atom x5-Z8550 Processor, up to 4 GB LPDDR3 RAM, and up to 64 GB of ROM, the performance tests came out relatively positive. Using three different performance tests we found the Yoga Book to have a high end CPU that supports large apps with excellent multitasking (AnTuTu), that it can run 3D games in mid-quality mode smoothly, and ideal marks from 3DMark’s Sling Shot Android benchmark. As the Yoga Book is more tablet than computer, including a smaller processor, it can hold out quite a bit longer with battery life. It features a li-ion polymer 8500 mAh battery, which according to Lenovo will last 15 hours with general use or 70 days on standby. Based on our tests, we found it lasted closer to 12 hours after a full charge, using it for streaming video, word processing, web browsing, and a bit of app gaming. In the past, Lenovo has received some flak for including their apps by default. But personally, I’ve found them to be super useful and if all else fails easy to remove. With a modified Android 6.0, (Nougat on the way), the Yoga Book lets you multitask for certain apps, in addition to the existence of a UI task bar. Of the Lenovo apps, there are two that standout. The first being more obvious, Note Saver app, is designed to work with the Halo keyboard so that you can take notes. Either using the magnetic notepad or the Wacom powered keyboard to draw, take notes, or whatever else you use a pen and paper for. Lenovo’s other apps features easy synching to any device, and also provides a really great way to capture information and spin it into a PDF. Using the builtin camera, you can capture presentations and other items, which are then turned into clear and accessible digital versions. We didn’t play with the Windows version, so we can’t speak to that. The Yoga Book is beautiful. It’s as simple as that. It’s light, the metallic finish looks wonderful yet elegant, and the watch hinge attaching the keyboard to the touchscreen is steady and firm. The only downside of the design, which is a bit of a nuisance, is that the rounded, flat edges require you to use both hands to open it from a closed position. Bright and glossy, the 10.1” IPS LED touch screen features a 1920 x 1200 HD ratio. With a color depth of 16.7 million pixels, the Yoga Book can be seen well in both daylight or at night. Due to the glossy screen, there can be a bit of a glare at times, but is typically not much of an issue. Lenovo took a gamble with their new Halo keyboard, and it certainly has a learning curve. For those of us who follow standard typing practices (fingers on F and J), the buttonless keyboard will take some time to get used to. In fact, as we wrote this review, we had constant struggles with typos and accidental key presses. Deeper into writing the review, we were able to become more familiar with the spacing of each key (which is very roomy), and had a smoother experience. By comparison, it’s similar in nature to any on-screen virtual keyboard, but this also has the added benefit of haptic feedback (vibration) for each key press to give you a physical response. The trackpad works ok, but if you’re coming from a Mac, you’ll likely have some settings to adjust. At times, it’s also a bit over-sensitive, translating touch for clicks. For doodlers and note takers, the new Wacom powered Create Pad feature built into the Halo keyboard is beyond novelty. Thanks to the Real Pen, the accuracy you get is both surprising and easy to use. The Create Pad uses 2048 levels of pressure sensitivity with 100-degree angle detection. Depending on the pen tip you use, you can either write directly on the Halo keyboard or write on a regular notepad that registers the drawing or notes to an app. Unfortunately, it does not automatically backup to the cloud (requires you to do save and place it in your desired box), but you can use the Create Pad regardless of the Yoga being in sleep mode. Should you buy the Lenovo Yoga Book? If you’re looking for a great two-in-one and have a knack for writing or design, then this will be a great fit. The Yoga Book would be hard pressed to replace your full blow design setup, but for those on the go or who like to storyboard or design on the spot, I can’t think of a better or more affordable solution.